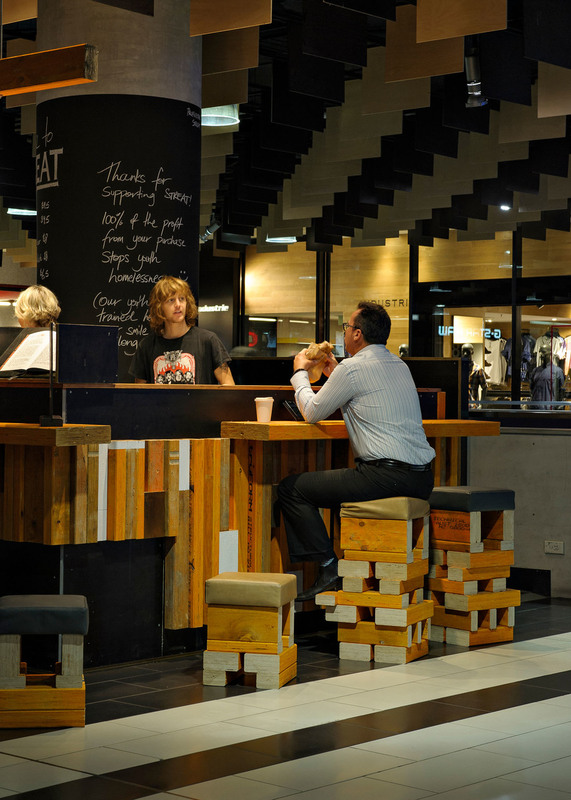 Six Degrees were engaged in this pro-bono project to design a new café for STREAT, which activates an under utilised space at Melbourne Central. STREAT is a foodservice social enterprise, dedicated to providing training and employment for young people who have been living on the street or are at risk of being so.The design intent was to make simple raw materials into intriguing objects. Materiality is expressive, using Truform structural timbers as three dimensional, decorative surfaces, with strong colours and shapes based on utilitarian origins of structural coding. Seating is custom designed and also uses simple Truform structures with soft leather seat tops for comfort. The elements are resolved in section to add mass and texture to the forms. The overall visual effect is one of relaxed earthy textures, with a delicate Art Deco elegance.Six Degrees are currently working on a design for the new flagship bakery and office/training centre for the STREAT organization in Collingwood.